Tony Greenstein's Blog: Conservatives Anti-Semitic Friend Declares his Undying Sympathy for Israel! Conservatives Anti-Semitic Friend Declares his Undying Sympathy for Israel! The row over the Tory Party’s choice of allies in the European Parliament rumbles on. In particular over Michal Kaminiski, member of the far-right Law and Justice Party in Poland’s Sejm and leader of the Conservatives and Reformists Group in the European Parliament. Leaving aside Robert Zile’s Freedom and Fatherland Party in Latvia, which has a soft spot for all those Latvian SS men who helped round up the Jews. What is interesting in this debate is how, BNP style, Kaminiski’s retort to the allegation of anti-Semitism is: ‘What me? But I support Israel.’ And that is precisely the problem. It reminds me of a quotation in Francis Nicosia’s new book, ‘anti-Semitism in Nazi Germany.’ . And that is precisely the point. If someone says that they believe Jews don’t belong in this country and should depart, then they are either an anti-semite or a Zionist or both. So it’s no surprise that Israel’s Ambassador to Britain, the intellectually challenged Ron Prossor, should be up there giving Kaminiski his full support. Likewise the Conservative Friends of Israel stand shoulder to shoulder with a man who has opposed any form of Polish apology for the massacre at Jedwabne (because Jews should apologise for the behaviour of the Soviet Union – understandable if you hold that Jews collectively were responsible for Stalin's atrocities or for Communism more generally, which is something Hitler certainly believed in. Kaminski also paid homage to see General Pinochet when he was under house arrest in Britain, presenting him with some Catholic curiosity. Leaving aside of course his anti-gay credentials. Now it may be, as some have argued, that Kaminski is more an opportunist than a fascist supporter. But regardless he makes a good bedfellow for both Israeli apologists and David Cameron. Interestingly, senior members of the Jewish Leadership Council have been spitting blood at the letter Vivian Wineman, President of the Board of Deputies of British Jews sent David Cameron asking, ever so politely, about his new far-right friends. Of course this is no irony at all. I can once remember watching a programme featuring one Ian Paisley, leader of the Democratic Unionist Party in Northern Ireland. He littered his conversation with anti-Semitic epithets, but this man was as pro-Zionist as you could get. What of course the unnamed senior Jewish conservative meant is that ‘anti-Semitism’ is only a stick to beat the left and those horrible Muslims around the head with. It’s not actually mean to be taken seriously, as in anti-Semitism, hatred of Jews. ‘Anti-Semitism’ is merely a form of defamation and libel to be used against anti-racists in the name of Israel’s war against the Palestinians. It is effectively the conscious and deliberate misuse of the memory of those who died in the Final Solution to bolster Israel and US imperialism. Michal KaminskI, the Polish MEP at the centre of the controversy over David Cameron’s European alliances has admitted he wore the symbol of a totalitarion group, claims he had previously denied. In an interview with the JC, Mr Kaminski was asked if he had ever said he was proud to wear the Chrobry Sword, the symbol of the National Radical Camp (ONR). Formed in 1934, the extreme rightwing, nationalist ONR- Falanga was largely a student movement, but practised violent anti-Semitism including attacks on Jewish students, buildings and businesses, organised boycotts of Jewish businesses and attacks on left wing groups. Mr KaminskI categorically denied knowledge of wearing the Chrobry sword symbol. But Mr Kaminski later issued a clarification, where he admitted he had worn the badge. "I did wear the sword, which was used around a millennia ago to crown Polish Kings, on my lapel on occasions. After 1989 it was used as one of the symbols of the Christian National Union and many Conservative politicians would wear it, including politicians now in the Civic Platform. “In recent years it has been taken as a symbol by the Far Right. Although it is not the same, there are similarities with how the BNP in Britain has taken the Union Jack as their symbol. He added: “I acknowledge that it is possible that my pronunciation was unclear, so I am happy to clarify his position on this controversial symbol." 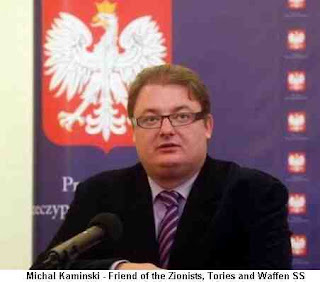 When I finally interview Michal Kaminski he is looking extremely flustered, not to say hounded, by the attention he has received during his flying visit to Conservative Party conference. The controversial leader of David Cameron’s new allies in the European Parliament has been chased into a fringe meeting by a woman from Channel 4 and to the doors of a lunch hosted by Conservative Friends of Israel. Allegations about his far-right past have quite literally pursued him to a suite at Manchester’s Midland Hotel. Here it is that the 37-year-old head of the new European Conservatives and Reformists grouping has chosen to explain his controversial past statements, which range from the Holocaust and the role of Jewish partisans in the Soviet occupation, to General Pinochet and homosexuality. He adds that he considers that western civilisation is essentially Judeo-Christian and therefore “created to a big extent by Jews”. Mr Kaminski says that he understands the concerns raised by some of the allegations against him. His colourful CV has already caused acute embarrassment to the Conservative Party and provided ammunition to those who say Cameron has rejected the mainstream centre-right in Europe in favour of a rag-tag bunch of apologists for fascism. At the same time, his robust support for Israel provides Anglo-Jews with a dilemma. 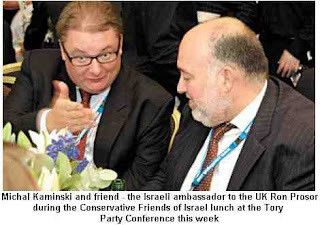 His status as guest of honour at the CFI lunch demonstrates the level of trust he commands among leading Jewish Tories. His visit to Israel last month saw him welcomed by Deputy Foreign Minister Danny Ayalon. Mr Kaminski himself raises the issue of Jedwabne, a town in the north-east of Poland which was the site of a massacre of hundreds of its Jewish inhabitants in July 1941 by a mob of Poles. Sixty years later, the then Polish President Aleksander Kwasniewski issued an apology for the atrocity, but the issue was hugely divisive. As the deputy in the Polish parliament responsible for the area, Mr Kaminski expressed his opposition to a generalised apology, a decision he stands by. From the very beginning I was saying as a human being, as a Pole, that Jedwabne was a terrible crime, unfortunately committed by the Polish people. My point was from the very start: we are ashamed of these people, we have to condemn them, we have to judge them if they are still alive. But I don’t want to take the whole responsibility for this crime for the whole Polish nation. My position is that there were acts of collaboration of the Jewish people with the Soviet army when the Soviet army came to Poland. It’s a fact. It’s a historical fact… If you are asking the Polish nation to apologise for the crime made in Jedwabne, you would require from the whole Jewish nation to apologise for what some Jewish Communists did in Eastern Poland. 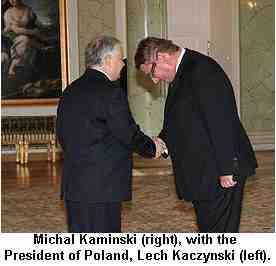 There is no doubt there has been a concerted attempt by David Cameron’s political enemies to discredit Mr Kaminski. But there are areas of his own political biography where he admits he made serious errors of judgment. In 1999, he visited the Chilean dictator Augusto Pinochet in London, an event he described as “the most important moment of my whole life”. He later made a statement to the Polish parliament saying he regretted his actions. He says: “I think I made a mistake visiting Pinochet. A decent politician should have the courage to admit the mistake”. I wonder if he thinks it was also a mistake to have described homosexuals as “pedaly”, a derogatory term akin to “shirt-lifters”. Again he admits an error of judgement. “I said I would never use these words again. But please remember it was a word used commonly by Polish politicians about homosexuals. “Since I discovered that this word was offensive in the eyes of homosexuals, I never used it again.” As we end the interview he talks of his pride at heading up the new conservative grouping in the European parliament and his great respect for British Conservatism. But Mr Kaminski cannot have imagined that he would end up as such a controversial figure for the party that has inspired his politics for so long. The creation of the ECR has been a huge risk for David Cameron, brought about because he needed to provide some “red meat” to the Eurosceptics in his party. In the final irony, though, it turns out that Mr Kaminski is himself an enthusiastic Europhile who has embraced the Lisbon Treaty so hated by the right-wing of the British Conservative Party. “I was on the side of those who were in favour of the Lisbon Treaty. It is well known in Poland. It is not a secret,” he says. I apologise that so much of the interview has been taken up by allegations from Mr Kaminski’s political enemies. To his credit he says that it has been important to answer his critics. I did wear the sword, which was used around a millennia ago to crown Polish Kings, on my lapel on occasions. After 1989 it was used as one of the symbols of the Christian National Union and many Conservative politicians would wear it, including politicians now in the Civic Platform. In recent years it has been taken as a symbol by the Far Right. Although it is not the same, there are similarities with how the BNP in Britainhas taken the Union Jack as their symbol. When I felt the symbol started having this meaning I stopped wearing it and I asked the rest of my party to stop too.